Back to the Selby v Stevens match, both players did not get use to the fast speed of the table although Selby played in the event last year. Stevens missed the very last chance to win the match in the last rack. 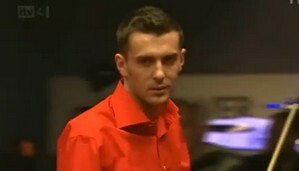 Eventually the world number one Selby won the match by 243-196. Mark Selby is going to play Mark Allen in the quarter-finals who beaten John Higgins in the first round. Allen led Higgins by 85-45 after the first rack before being rewarded ball in hand for Higgin's foul in break-off shot of the second rack. 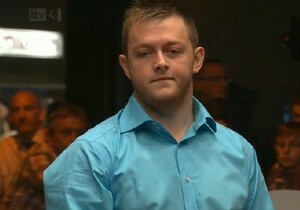 Nevertheless, Higgins caught the chance left by Allen to trail 122-128. Allen potted Power Ball in the third rack to extend his lead for over 60 points. Hope of Higgins was gone when his cueball was off in the last minute of the match. Allen successfully defeated Mr. John Moustache by 255-177. The Ace Judd Trump and Martin Gould entered the arena shortly to play their match. Trump was predicted as the winner of the match but the results varied from their expectations. Gould impressed the audience by striking Trump 332-229 to get through to next round. It was The Pinner Potter's showtime after the second rack, Gould built up his advantage for more than 130 points when only four minutes was left. There was no way turning back for Trump and Gould was the clear winner. 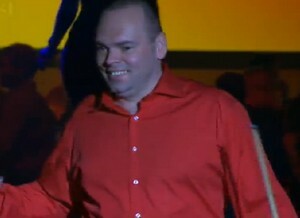 Stuart Bingham set up a clash against Gould by beating Shaun Murphy 376-112. Bingham was in the complete control throughout the match. Stephen Lee beaten Mark Williams who has his ankle hurt early this week by 17 points difference. 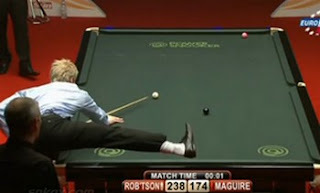 Neil Robertson was happy to beat Stephen Maguire by 238 - 174. His action on the above picture could tell you how excited he was! 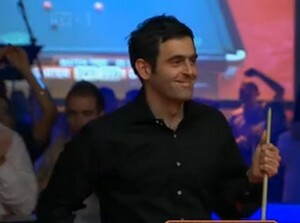 Ronnie O'Sullivan made it through after beating The Captain 335 - 245 after getting 24 foul points for a foul and miss. Carter once led The Rocket 111-8, 245-231 but he could not hold the Rocket. Ronnie said he was lucky to claim this victory. The last match was brought you by runner-up of the event last year Ding Junhui and Graeme Dott. The match was pretty close and invovled number of safety shots. Ding closed the gap to 180-185 in the third rack but Dott potted Power Ball in the last rack to help him winning the match 288-182.